The F-4 Phantom II was a two seat supersonic long range all weather fighter-bomber originally built for the US Navy. 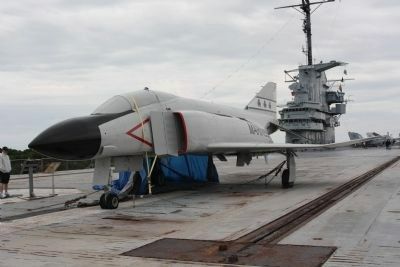 The Phantom II began service aboard aircraft carriers in the early 1960s, and would set many speed and performance records. 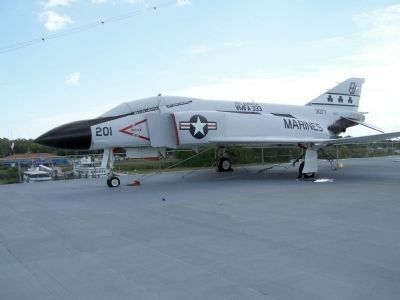 During the Vietnam War, the Phantom II would be used by the Navy, Marines, and Air Force. The Navy began replacing the Phantom II with the F-14 Tomcat in the mid 1970s. Marines used the Phantom II until replaced by the F/A-18 Hornet in the early 1990s. The last Air Force version (F-4G Wild Weasel) retired in 1996. The Phantom II continues to serve in many foreign militaries. Erected by Patriots Point Naval and Maritime Museum. Location. 32° 47.493′ N, 79° 54.503′ W. Marker is in Mount Pleasant, South Carolina, in Charleston County. Marker can be reached from Patriot Point Road. Touch for map. Aboard the USS Yorktown. Marker is at or near this postal address: 40 Patriots Point Rd., Mount Pleasant SC 29464, United States of America. Touch for directions. Other nearby markers. At least 8 other markers are within walking distance of this marker. 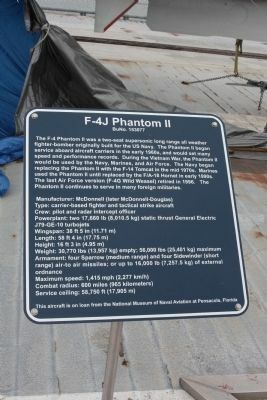 The F-4 Phantom Pilots (here, next to this marker); A4C Skyhawk (a few steps from this marker); The A-4 Skyhawk Pilots (a few steps from this marker); F/A-18A Hornet (about 300 feet away, measured in a direct line); E-1B Tracer (about 400 feet away); Clamagore (SS-343) (about 400 feet away); The A-7E Corsair II (about 500 feet away); SH-3G Sea King (about 500 feet away). Touch for a list and map of all markers in Mount Pleasant. More. Search the internet for F-4J Phantom II. Credits. This page was last revised on March 7, 2019. This page originally submitted on May 18, 2009, by Mike Stroud of Bluffton, South Carolina. This page has been viewed 1,732 times since then and 8 times this year. Last updated on March 2, 2019, by Robert Paul Schodt, Sr of Waterford, Pennsylvania. Photos: 1, 2. submitted on May 21, 2009, by Mike Stroud of Bluffton, South Carolina. 3. submitted on September 30, 2013, by Mike Stroud of Bluffton, South Carolina. • Andrew Ruppenstein was the editor who published this page.